Well, folks, that’s it. My fifteen-year obsession with Jupiter/Uranus conjunctions is over. Time to move on to “pastures new”. It is my hope that this extensive archive of articles and research will be of interest and value to astrology students and researchers – and their teachers – both now and in years to come. The archive includes a study of the behaviour of those two planets over 2,500 years, and the fascinating correlation which I have found to exist on the macro scale between the movements of Jupiter/Uranus conjunctions and the unfolding of human history. I had a faithful group of 10 volunteers from across the world who stayed with the project of reporting the symbolic impact of the 2010-11 Jupiter/Uranus conjunctions on all their lives. Their feedback is to be found in the “Tales from the Wild Ride” series in the archive, along with all their charts, data and names withheld for confidentiality. I am most grateful to them for their participation. Perhaps it is apt to close on a personal note. What clues are there in my horoscope to this long-running Jupiter/Uranus obsession? 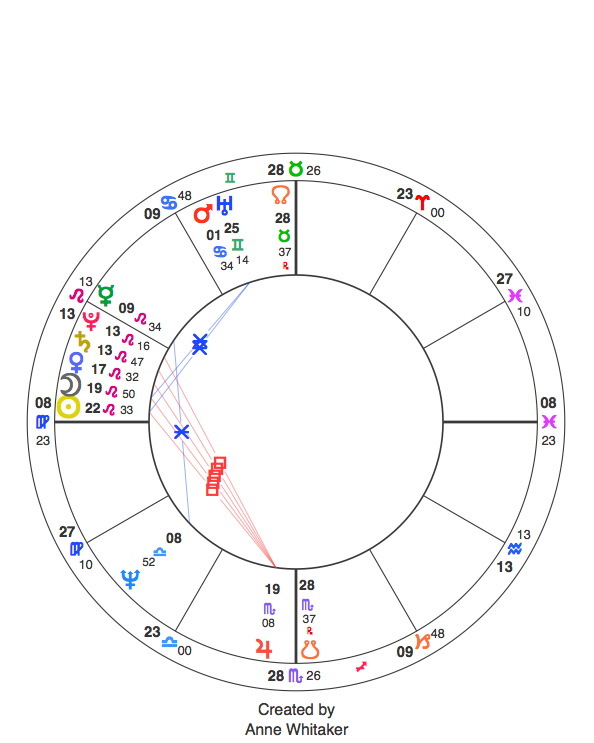 Have a look – perhaps the bowl shape led by Uranus/10th, closed by Jupiter/3rd, is a clue? And the Asc/Desc falling on the Jupiter/Uranus midpoint, maybe? Quite a number of readers have asked me about MY Jupiter/Uranus year 2010/11: what disruptions and changes have come into my life? I said I would not say anything about my own life until the end of the project. Given the conjunction sextiling the MC/North Node, and squaring a natal Mars/Uranus conjunction in the 10th, the answer is – quite a few! Firstly, my husband and I have unexpectedly become grandparents, our granddaughter having been conceived during the week of the Jupiter/Uranus conjunction in Aries in early June 2010. Secondly, I am off to be a student again in the autumn of 2011, to do a two-year part-time MSc degree in Counselling Studies at a distinguished Scottish University. My aim is to update my counselling skills qualifications, and to use the compulsory research module to ground me in more formal and rigorous research methodology than I have employed to date. My aim then is to use the second year’s 15,000 word dissertation to sketch out the basis for my third book. And who knows what else may arise therefrom? So there it is. Many thanks to all the many readers of this blog, especially those commenters and emailers whose generous encouragement has kept me going at times when I was flagging! 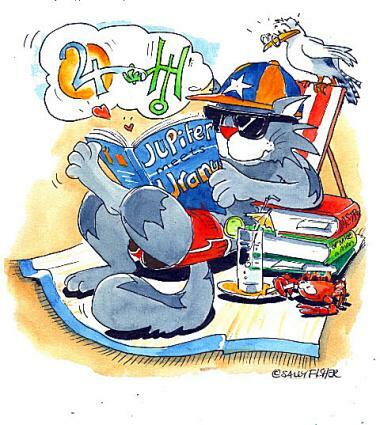 Do drop in on my main blog: Writing from the Twelfth House, and my astrology blog: Astrology: Questions and Answers. This entry was posted in 001. 3 April 2011: Jupiter Uranus mission complete! and tagged "As above so below", 14-year Jupiter/Uranus cycle, 1997 Jupiter-Uranus conjunction in Aquarius., American Federation of Astrologers, Autumnal Equinox 2010, Jupiter-Uranus conjunction in Aries June 2010, Jupiter/Uranus conjunctions, Jupiter/Uranus conjunctions in Aries and Pisces of 2010/11, Michelsen’s “Tables of Planetary Phenomena”, mundane astrology, The Aries point, the cycle of life, Writing from the Twelfth House. Bookmark the permalink. I have thoroughly enjoyed travelling along with you and am delighted that after a short break you will be back keeping in touch with us all. it’s a bit like miss jean brodie and her puils isn’t it – I have the utmost respect for my teacher of astrology and still hear your words ringing in my head from time to time – we were very well schooled!! Thanks Sheilagh! My words ringing in anyone’s ears – a scary thought! But I’m glad a few of them at least appear to have clung to your braincell. See you soon.